“La Gritería” is another important celebration in Nicaragua during December festivities. Unlike “Purísima”, that is celebrated throughout December, the “Gritería” takes place on December 7th on the eve of the “Day of the Immaculate Conception of Mary” celebrated worldwide on December 8th. Both, Purísima and Gritería, are organized by hosts or home owners. It is similar to a “Purisima” where hosts make and decorate an altar for people to sing to the virgin. The difference is that you need previous invitation for attending a Purísima while you don’t need one for attending a Gritería; you can just visit any house with an altar, enter and sing to the virgin. Its origin is attributed to the city of León in 1857, when Monsignor Gordiano Carranza, from the San Felipe church, invited the people to raise altars house by house to celebrate the virgin. The hosts decorate their altars in the porches, terraces or entrances of the houses and from 6:00 pm on, they open their homes for anyone to come in and sing to the virgin. Just the same as in a Purísima, the hosts hand out the traditional gifts of the “Gorra” and explode gunpowder while people are singing the traditional “Marian chants”. In the neighborhoods of Managua it is common to see families, neighbors and friends get together to go out massively to the streets to look for altars and sing to the virgin Mary. In some neighborhoods you may appreciate up to 4 altars by block. In spite of being constitutionally lay, the government also celebrates the Gritería through the different public institution by making majestic altars in the historic Bolivar avenue in Managua. This has been done over the last few years and has become a small tradition. In Granada, it is celebrated a little differently. The altar is not by home but it is by district and they assemble an altar that represents them. Here they make processions from altar to altar. León, the original city of this tradition, is one of the destinations where you can enjoy the most this festivity. Altars are very beautiful, creative and you can notice the effort that each home put in decorating for the virgin. You can also witness “The gigantona dance”. Hundreds of people come from all over the country every year to sing to the virgin and tour the picturesque streets of this beautiful and historic city. *There is also another celebration of similar characteristics named “La Gritería Chiquita” and it’s celebrated on August 14th in León. 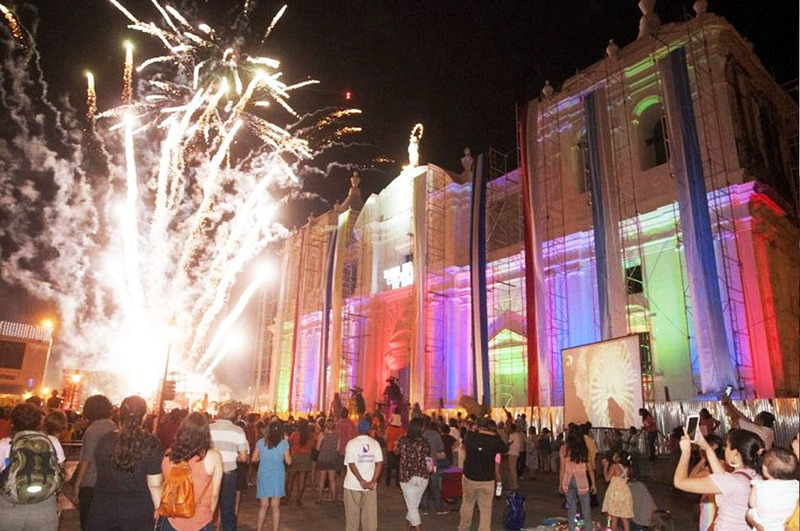 In Chinandega the party is lived with greater devotion, inclusive, a noon “Gritería” is carried out, but the greatest attraction begins on December 6th with the traditional “Lavada de la plata” at the “Basilica Menor Nuestra Señora del Trono”, in El Viejo. At the end of the traditional mass at 9:00 a.m., the image of the virgin is descended from her dressing room and at that moment starts the washing of pieces of gold and silver that symbolize the soul cleansing of the peregrines. That same image of the basilica, which is descended only once a year, was in the hands of St. Teresa of Jesus and was brought to the country in 1562 by her brother Pedro Alonso Sánchez de Cepeda y Ahumada. All these traditions, “Gritería”, “Purísima” and “Lavada de la Plata” take us back to Colonial times and have great significance for Nicaraguan culture especially for Catholics. For these dates you cannot forget to visit the most important and traditional sites to be part of the celebration. You can start the morning of December 6th in El Viejo, Chinandega, celebrating the “Lavada de la Plata” and then the noon Gritería. Next day you can visit León or the neighborhoods of Managua where the shouting is more crowded. The same December 7th you can take a look to the altars of the Bolivar avenue in Managua. Other places where you can stay on December 7th are Granada or Masaya where it is also celebrated with great joy. We hope you have enjoyed this series of articles about these peculiar celebrations that are so important for Nicaraguans. We hope to see you soon being part of our tradition and before I say goodbye … Who causes such joy?